As public managers, we live in an international and interconnected world, which is becoming interdependent due to increased technology. While technology is important, the real key to success in taking advantage of global talent and opportunities is having the right perspective and relationships. We live in an increasingly complex world full of change but also brimming with new opportunities for those able to chart a new course. To do so, it is important to cut through the clutter and confront the challenges of the future by focusing on the real world and working together with clear purpose to repair the international social fabric. 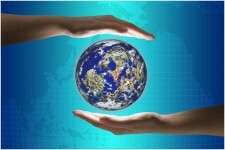 Many organizations have not focused on developing an international perspective or global connectedness and interdependence. Even if they recognized the need to do so, many don’t know how. It requires changing one’s perspective and then moving from making judgments about other societies, in terms of one’s own cultural assumptions or bias, to reaching out and serving the international community through an informed perspective that has greater acceptability. I recently surveyed and interviewed 125 government and nonprofit leaders, representing more than a dozen nationalities. The leaders ranged in age from 42 to 66. Approximately 55 percent were women, 45 percent were men and all had held varied positions across more than 30 countries. I asked them to self-report on what an international perspective is and why it is important to the future generally and public administration more specifically. Follow up interviews with 100 individuals were done to clarify their responses. They generally agreed that perspective refers to the way people view or regard something and that it characterizes a person’s point of view. In our increasingly globalized world, having an international perspective is the ability to view issues from the point of view of people living in other countries. A conflict in one part of the world, for example, might be understood and regarded quite differently by people who live there than by people living elsewhere. Respondents felt that someone could gain an international perspective through studying history, languages, cultures and by traveling to other countries. With regard to public administration, the majority felt that a new perspective was necessary in order for public administration to be fully functional in the future and this new perspective should address international connectedness, interdependence and the complexity of the world and the professional field. They saw a need for researchers to study the stages of human development in socio-economic terms, with a retrospective and historical analysis of lessons learned, experiences shared and common or transferrable achievements. Those learning moments should be applied to a prospective view into the future regarding challenges and solutions. When placed in a historical context, even the most stable political, social and economic institutions are subject to change and should be treated as learning opportunities. There should also be a balance between the tendency to generalize and to specify solutions so that public managers are able to overcome confusion and start working together with clear purpose. Knowledge should be shared using governance structure, managerial systems and political and cultural norms from different countries. Such studies should go beyond the collection of cases unique to their context but also aim to identify the mechanisms linking the case to other contexts and assess whether such mechanisms will work in other countries. U.S. scholars should focus on domestic issues in comparison to other countries. Experiences in alternative contexts could provide reference points to understand particular issues in the United States, contribute to theory building by revealing underlying assumptions that may be parochial or ethnocentric and help find alternative solutions to address problems that are more global. To accomplish this, respondents felt it necessary to create a more international perspective by promoting more viable, integrative and relevant cross-country studies. This could be accomplished by forming cooperative teams of researchers from the United States and other countries as well as encouraging multiple case analyses from comparable countries, not just a single-case approach. They also recommended that research focus both on inside-out and outside-in issues so that unique, important and relevant issues in one country can be analyzed and applied to other countries and cultures. With regard to teaching public administration, respondents noted a growing number of programs within the United States and in other countries that identify themselves as having an international emphasis. These include programs at Harvard, Monterey Institute of International Studies, Florida International University and Syracuse University. These programs enroll international students and provide courses specific to international issues. They often are not public administration programs, but instead are business administration programs. These programs recognize that early exposure to international experiences is critical for personal growth and career development of both domestic students and international students. Education with an international experience deepens their understanding of American public administration, raises their awareness of global issues and enhances their capacity to analyze and manage public policy problems. Some schools have established institutional global connections with global partners to provide students with study abroad opportunities through international fellowship programs, foreign executive training programs and academic exchanges. As an example, the University Studies Abroad Consortium (USAC) provides opportunities for students to complete courses in 26 countries and 800 universities including but not limited to China, Spain, Costa Rica, Cuba and Italy. The University of Texas Dallas has an International Foreign Exchange Program collaborating with universities in Austria, Australia, Germany, Korea, Poland and Turkey. Columbia University’s School of International and Public Affairs has a two-semester International Fellows Program where students from all graduate degree programs examine the current international world order and look ahead to what the new world will be like. In the final analysis, having an international perspective regarding ourselves and our future makes the most sense in today’s confused and troubled world. We live in a time of broken bonds. The trust between employee and employer, borrower and lender, citizen and government, consumer and manufacturer has been eroding and is damaged. Things need to change. There is also an increasing trend in solitary and transient living, which has led to less frequent socialization. Growing income inequality has reduced the sense that we collectively are all in this together. We can’t rebuild our social capital as individuals or as a country by continuing to do what we are doing. It is time to change our perception to an international one. It is time to expand and re-engage our personal connections on a personal and on an international level to provide an opportunity to create more shared time and experiences on which relationships are based. Natural resources and the environment. Internationalism is first and foremost a driver of change for good reason.